Is it just me or does social media seem to show everyone out here living their best lives? Like is everyone backpacking through Thailand and have passport stamps on stamps on stamps? So everybody out here happily married?👀👀 Okay coo! Are all the edges in the land laid, full and perfected swooped? Are all businesses out here booming, with six figure sales days? Is someone handing out 34-25-40 hour glass figures? How do y’all afford to brunch EVERY weekend anyway? Did I miss the line where they were handing out 800 credit scores, and Cartier bracelets? Does it seem like EV 👏🏾VER 👏🏾REE other mom perfectly prepares nutritious meals for her family, home schools her children and does so effortlessly? Does it seem like everyone has their life ALL the way together? Do you say to yourself “how does she always win?” If you’ve uttered “does she ever have bad days”, sis you ARE NOT ALONE! Do you wonder how does she do it all? Well she doesn’t do it all. She might have a nanny, an assistant. She may be overworked and a member of team no sleep. She may spend hours scrolling on social media, a slave to her life and business. You see when we come to our senses and think logically once again, we realize that most of what we see online are well crafted and edited snapshots. While it is no one’s “responsibility” to disclose the entire picture, it is our job not to discount all the good going on in our lives when we see folks out here “winning”. People will continue to only strategically share information that shows them in the best light possible. We have to remind ourselves of this here FACT! I KNOW you’ve seen the quote plastered all over our timelines that states: I will not compare my life with people on social media yet if we’re honest, we secretly continue to do so. WE ALL unfortunately travel with the comparison passenger who seeks to rob us of joy, peace and momentum. While it is natural to compare your life with others, it is usually NEVER emotionally healthy to do so. So what do we do? How do we manage our emotional responses when we see the wins of others? As a Christian women, here are some strategies I’ve found to be helpful when unbuckling this unwanted passenger and dropping her off right on the highway 🚗💨. When you see Tonya featured in a reputable press outlet, how does that make you feel? When Rhonda posts her daily earnings, do you cheer her on or secretly undermine or minimize her accomplishments? When you compare your life to others, what emotions do you encounter as a result? How does that “make you feel?” Do you feel left out? Do you feel like your efforts never produce the results you expected or wanted? Do you feel like folks less qualified than you are out here winning? Are you jealous? Do you feel inadequate? I need you to NOT RUN from these emotions! The tea is that we RUN FROM things that CHASE US! It’s up to us to stop the cycle by confronting. You can’t fix what you won’t ADDRESS. You have to acknowledge these thoughts and emotions SO THAT you can expose them to truth, IDEALLY God’s truth. Those secrets and hidden thoughts WILL continue to fester and rule you if they are not exposed and made 👏🏾out 👏🏾to 👏🏾be 👏🏾a 👏🏾liar. I know it’s difficult but these feelings will start to lose its power/influence and hold. So if you’re apart of the team that would rather pretend these matters of your heart don’t exist, you will find yourself never having true victory in this area. Victory that does not look like muting or hiding updates from folks on social media to ensure you are not privy to any and all celebratory posts. Because the gag is, you are placing a band-aid on a wound that is leaking and will never heal. You are simply avoiding the matters of your heart that NEED restoration. When was the last time you looked in the mirror was like “you betta go sis”?Honestly, when was the last time you celebrated a win, regardless if it’s “big or small”. Make a daily practice of affirming your dopeness. Maybe that looks like journaling. Maybe that looks like reciting OUT LOUD all your amazing qualities. Be inspired by the success of others just NOT at the expense of dimming down your own light. You are more than good enough! Simple prayer: Lord help heal those hidden areas where my self love and identity had been under attack. You love me. You qualify me. You accept me. You equip me. Lord show me just who I am according to you. Remind me of your perfect love that gives me joy, satisfaction and confidence. At the heart of this comparison trap is lacking contentment and gratitude for ALL God has provided you with. Let’s not be confused: contentment has nothing to do with passivity or lacking ambition. Contentment says to God: You are enough. I am satisfied. Isn’t it funny how most of us are in a season we prayed for. There was a time we asked God for the VERY thing(s) we now probably take for granted. It’s that ole “new shiny toy syndrome” that affects us all. We have lost our thankfulness. The harsh truth is with this heart posture, we place God on the stand, to defend Himself while we accuse and judge Him for not giving what we FEEL is best for our lives. We feel overlooked and overshadowed. We feel NOW is the time to reap. We have to remember that God’s timing is perfect and He has given us a perfect portion! It’s time we ask for forgiveness and repent for judging God as unfair. It’s time we say thank you for His provision, the talents He’s given us. It’s time we remember to trust God. Trust that God has not forgotten us. Trust that God is working things out on our behalf. It’s time we remind ourselves that God is still good and His ways are so much better than ours. Besides could you even imagine if God gave us all that we ever wanted? Exactly! A FULL on mess! He knows best and let’s trust Him to govern the galaxies AND our lives! Simple prayer: Lord forgive me for being ungrateful when you have more than merciful, giving and loving. You are a good Father who gives perfect gifts. Help restore my satisfaction in You! Raise your hands if this sounds familiar: you host an sold out, at capacity event, with over 200 attendees. You feel like you’re on cloud nine. You’re praising God, ugly crying and thankful for how He’s been able to carry you through planning an event and for it to be a successful turnout. Weeks go by, and you observe via social media that a similar event to yours, had what appears to be double the amount of panels, workshops and attendees. Instead of genuinely being happy for their success, you compare and lose your contentment for what you accomplished. You KNOW how hard it is to plan and EXECUTE an event, yet your immediate emotional response to seeing someone else’s success, is to discount how DOPE your event was. Unfortunately most of us lack the ability to see someone else winning without equating it somehow to “I’m losing”. We have to learn to look at their successes objectively, without negatively internalizing our perceived failures. There is more than enough space for EVERYONE to win. We will never know the hard work and sacrifices that others make to obtain and walk into their “glow-up season”. Who knows the long hours, lack of sleep, time and money invested to receive the fruits of said labor. So for these very reasons, learn to rejoice with those who rejoice. Drop a congratulatory comment when they post great news. Send a text. Give them a call. Ask God to help you genuinely celebrate the wins of others. Because you will not feel like it at first. Wouldn’t you want someone to celebrate with you? It is time to UPROOT and REPLACE all the lies that you are believing about yourself and where you are in life. Look to The Bible and read the love letters of who God says you are. He validates you, not what you have or accomplish. His TRUTH about you is all that should matter. Besides, it is dangerous to equate our identity with fleeting accolades like experiences, accomplishments and things. Take back your self worth. Say it with me: I am not what I have or do! Anchor yourself in a steadfast God who has declared you to be: chosen, loved, not forsaken, precious, redeemed, holy, whole and so much more. This is exactly why I created the Who God Says I Am shirt below. Grab it from my shop (click here) for you and someone you love RIGHT NOW! If you are tempted to constantly “one up” or compete with folks on the innanets, you have already lost. You will find yourself on an emotional rollercoaster if you attempt to play this game, especially if they have NO IDEA you’re competing with them. It’s just not worth your time: I promise you. Besides we NEVER truly know the cost people pay to present and maintain the lifestyles they appear to have. We never know the schemes, scams or anxiety they carry to showcase a lifestyle they may not truly be able to sustain and afford. Keep your eyes on your road sis! You can’t drive your car and arrive at your desired final destination safely, if you are looking to your left, right and rear view. The reality is someone will always have more than you. Someone will always be prettier, made more accomplishments, have more recognition, get paid more than you and etc. The goal is to not be defeated by their wins. The goal is to be able to truly cheer them on. The goal is remember God’s ever present hand on and in your OWN life. So I leave you with this as you do the hard work of mastering this heart issue: GIVE yourself grace as you learn to reprogram your ability to drift back into a comparison cycle. While I want to validate and empathize with you, my mission with this post is not to condemn you for feeling what you’re feeling. Like bis sis Myleik Teele of The My Taught You Podcast says: feelings are not facts. My goal is that you do not allow these temporary and fleeting emotions rob you of your joy and peace that God has promised you. My prayer and mission is to have you dig deep and uproot anything that is robbing you of who you are in Christ and as a result all you have access to as His daughter. Get in God’s Word and presence. You are MORE THAN ENOUGH! There’s no need to compare and contrast your life. How do you deal with comparison? Do you think people should only show the good moments and not the bad? Self-care is not some buzz-word created to self-indulge and neglect our responsibilities. It is actually very crucial to living an intentional healthy mental and spiritual life. Whether you’re a side hustler or full time entrepreneur, you have a unique set of challenges. You are overwhelmed, tired and frustrated. Which is why carving out time for self-care, or more importantly, soul-care, shall be crucial to creating a sustainable lifestyle long-term. Don't spend so much time in your business that you neglect the most important part of your business: YOURSELF! Here are five ways to master self-care. You can’t effectively pour yourself out in service of others if your well is dry. The only way to stay refreshed and replenished is to draw from God’s well, that never runs dry. You do this with intentional, uninterrupted, consistent time with God. This is your war room room. This is your time of arming yourself. This is your time for bathing in God’s love. This is your time for receiving from God. This is your time to loving ON God. Don't ever become so busy that you neglect time alone with God through prayer, and Bible reading. You get to determine what that looks like, however just make sure it is disciplined, un-rushed and meaningful. 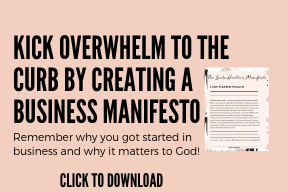 Stay tuned for devotionals for the "busy entrepreneur". I am a fan of getting to the source. My long term strategy is to treat the ailment on its deepest level rather than placing band-aids on gapping wounds. With that being said, self-care is the remedy to what may be a deeper issue: your triggers. Are you stressed? Why are you stressed? Are you anxious? Why are you anxious? What fears are keeping your thought life captive? What patterns of thoughts are you believing that are contrary to what God says? Get to the bottom of what may be robbing you of your peace, joy and mental health. Once that part is done, you can create an action plan to combat all those barriers. Now that you have prioritized your spiritual retreat time, it is time to strategize your physical wellness plan. The second best way to care for yourself is through exercise, great sleep and healthy eating. Your hours are long and you need the fuel that this trifecta will bring you. I know you're busy, however there are plenty of resources out there that accommodate the busy boss. In regards to healthy eating, whether you choose to cook or budget your meals outside of your home, just make sure they are nutritional and feed your body what it needs. In regards to physical activity, there are EFFECTIVE routines that cost you a smooth 15-30 minutes. (If you don't have 30 minutes to commit to your health, we have a deeper issue.) Lastly in regards to sleep: close the laptop and put away the phone. Business will go on JUST FINE without you in it all day! Put your trust BACK IN GOD’S HAND to lead and watch over your business so that you can rest REST! I can’t say how many hours are necessary for your body, just make sure that it is a quality amount. Because listen whoever said “I will sleep when I’m dead”, is a FULL ON fool. Get your sleep sis. This is hard for me. I tend to take on the entire world, become overwhelmed because duh, I can't do it all. I then either give up or procrastinate which then exasperates my stress levels. Just a vicious cycle of heightened cortisol levels. If you've been trying to do it all, it might be time for help. I'm not suggesting hiring an entire workforce. That might just be hiring an intern part-time, or a virtual assistant. Support may also come in the form of a business bestie or a peer group. It also maybe time to invest in a business coach whose sole purpose it to help you gain clarity and strategy for how to scale your business. I know how hard it is to release control and have someone working alongside you, but you have to realize you need the help. Ask God for the direction needed to make a wise decision with bringing on additional help. Ask for someone with integrity, is coachable, committed and more than qualified to do the job. Lastly do not feel bad for taking time out for yourself. You can’t fully show up for folks when your tank is on EMPTY. Even The Lord retreated when necessary. You've heard it before: The key is not to prioritize what's on your schedule, but to schedule your priorities. Be sure to prioritize your self-care. Let me know how do you take time out for yourself? Ugh, another case of the Monday Blues where you dragged yourself into the office. You know those feelings of dread, anxiety and regret. We spend week after week dreading this day, as if we are unaware it will come around quicker than we know. Listen I get it, Mondays kind of represent the end of our fun life and the beginning of adulting, pointless emails, horrible bosses and endless responsibilities. There is one thing about receiving tips from folks who are out here living the dream. It's easier for you to spend an hour meditating before work when you have the freedom to do so sis. However, there is another to receive insight from someone IN THE TRENCHES with you. Here’s a few practical hacks to help begin the process of shifting your mindsets and appreciating every day of the week, even Monday. Every day is a gift. Even as an entrepreneur, there are no perfect days. A thankful mindset says I will be content regardless of what life looks like. My happiness is not predicated by what I have, do and experience. Difficult, yes. Choosing to change your perspective takes dedication and time. It’s no wonder that most successful entrepreneurs discipline themselves to practice some sort of thankfulness. Maybe that looks like spending 5-10 minutes writing or thinking of 3 things you can be grateful for. If routine to you sounds unrealistic because you have children and you barely make it out the door, just hear me out. What I want you to consider is what you’ll gain when you intentionally set time for yourself before responsibility consumes your day. Starting out, if all you have is 30 minutes, be proactive and intentional with your morning. Create a realistic and attainable morning routine, that you can commit to. Aside from creating a realistic morning routine, Maybe that's a dope playlist or even a new outfit or accessory. Or even that extra Grande espresso drink with a mountaintop of whip cream. Load up some tunes, grab an amazing outfit, wear that new lipstick. If you can identify the source of your grievances, then you can have a plan of attack to combat. For most of us, we have no problems with Mondays, it’s that job we have so much disdain for. The real tea is to create the life where Mondays are just another day you slay. What is that dream you've talked yourself out of pursuing? Grab a notebook, get to Uncle Google and Auntie Youtube and begin to research that idea you've told yourself will not work and plan to create the life you deserve. Stop misusing Mondays and learn to maximize, as a gift, by courageously changing your mindset. Mondays can represent such a sense of possibilities. For all of us still working for someone else, how do you champion Monday Blues? January represents such a refresh for most of us and that is why I wanted to help you with a few things to consider for your business for this new year. Whatever is working well for you, be sure to double down on that. If you're looking for some new perspectives or tips, then this list of 5 Business Resolutions is for you. As a new business owner you are constantly faced with the fear of failure. As a result, you may find yourself crippled and stuck with inaction. As a new business owner and side hustler, as we develop our rhythm of what works, we have to learn how to pivot quickly so that we can move on to what does work. Don’t invest a lot of energy into trying to make the unworkable workable. Master the cycle of changing and testing. Walmart, Amazon, Zappos are well oiled machines that are very self sufficient. One factor is that they have developed systems and know what works and what does not work. If you're just starting out in your business, you are most likely working hard and not primarily wisely all the time. Until you find your sweet spot, you constantly throwing stuff on the wall and seeing what actually sticks. Meaning you are trying strategy after strategy that some expert recommended and hoping it will yield similar results. This is not shade, it is just my observation because I am there with you. What area in your business can you automate? How can you manage your business finances and not mix with your personal? How can you master your customer experience journey? The ultimate goal is to implement processes and solutions that can free up more of my schedule so I have time to work on scaling and growing our business, not just maintaining. You've seen the hashtag #collaborationovercompetition and I firmly ascribe to that. Don't fall victim to the scarcity and fear mindset that says I cannot make strategic partnerships that are mutually beneficial. Keyword, strategic. Practically speaking how can your product or service help serve someone's audience and vice versa. For example: if you an event planner, consider partnering with someone who specializes in brand sponsorship. You can help their audience plan events and they can help your audience secure sponsorship. Some experts suggest partnering with others with a similar audience sizes, but I don't completely agree. If your collab makes sense, it makes sense regardless of your audience size. Just be sure to build authentic relationships and be clear on your ask. I know how frustrating it can be to pour out, create and receive no immediate results, or results you were anticipating. Try shifting your perspective to give more. It may be tempting to consume more so that you can grow, however I want you to reach out to someone who has less knowledge/experience than you and offer to help them. I believe that when you pour into others, the gratitude you gain is invaluable currency. Be committed to providing value to others whether in a Facebook group, an Instagram post or in a small peer mastermind. These are the 5 strategies and mindsets I'm looking to adapt for this new year. Let me know what are your business resolutions?